Marta Gutman is co-winner of the 2015 Kenneth Jackson award for best book in North American history, shared with N.D.B. Connolly’s A World More Concrete. The committee is happy to announce its selection of Marta Gutman’s A City for Children: Women, Architecture, and the Charitable Landscapes of Oakland, 1850-1950 (University of Chicago Press) as co-winner of the 2014 Kenneth T. Jackson Prize for Best Book in American history. In a masterful, revelatory study, Gutman shows how the struggle to create a better environment for children transformed urban space and remapped landscapes of race, class, and gender. Gutman’s remarkable combination of historical and architectural research and analysis delivers fresh new insights into the shifting grounds of work, home, and leisure space. She provides an intimate window onto the lived experience of working-class women and children, in a turn-of-the-twentieth-century American city. The Urban History Association Program Committee seeks submissions for sessions on all aspects of urban, suburban, and metropolitan history. We welcome proposals for panels, roundtable discussions, and individual papers. We are also receptive to alternative session formats that foster audience participation in the proceedings. The Program Committee is pleased to announce that Loyola University Chicago will serve as the local host for the October 2016 conference. The conference theme – The Working Urban – highlights the importance of labor and of historians’ working definitions of “urban history.” We therefore encourage submissions that explore the scales at which historians work (i.e. local, national, regional) as well as those that interrogate the racial and gendered aspects of work in relation to the built environment. “Working” also refers to workshops. For the first time ever, the UHA conference will include professional workshops built specifically around interpreting primary sources and exploring problems of evidence in the field. Innovative workshop ideas are especially encouraged. 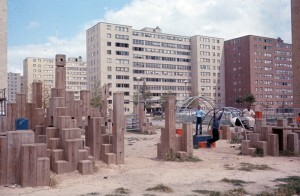 Several sessions at OAH 2015 feature urban history, including a showing and discussion of the documentary The Pruitt-Igoe Myth. Andrew Needham and Lily Geismer talk Chicago and suburbanization with Elaine Lewinnek, a professor of American Studies at Cal State Fullerton Her new book, The Working Man’s Reward: Chicago’s Early Suburbs and the Roots of American Sprawl, came out in the spring from Oxford University Press. (OUP, Amazon). Looking at gendered notions of urban development and industrial labor, she traces key episodes in Chicago history including the Great Fire and its policy aftermath, uses literature like The Jungle as a lens for examining real estate, and traces a history of race and space before the 1919 race riot. The Sunday sessions on the final day of an academic conference usually struggle to draw a crowd. Many of the attendees are just trying to make it to the airport to catch their flight home, while others set aside the final day to explore the host city. Two years ago, attending Sunday panels was far from the minds of most attendees at the UHA conference in New York City. Our main concern was making it out of the city, period. I remember nervously sitting in LaGuardia that Sunday afternoon with fellow Milwaukeean and regular UHA attendee, Amanda Seligman, mere hours before Hurricane Sandy made landfall. As were we filing onto one of the last flights to leave that night, airport employees were battening down the hatches, literally, covering food stands, waiting areas, and kiosks with tarps in preparation for floodwaters.